The NRA Basic Pistol course teaches the basic knowledge, skills, and attitude for owning and operating a pistol safely. This course is conducted in a classroom and at a live-fire range under the guidance and supervision of an NRA-Certified Instructor. 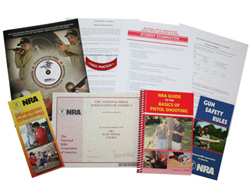 The course is intended for all law abiding adults regardless of previous shooting experience or NRA-affiliation. Course includes the following topics gun safety rules, proper operation of revolvers and semi-automatic pistols, ammunition knowledge and selection, selecting and storing a pistol, the fundamentals of shooting, and pistol inspection and maintenance. Course cost includes either a semi-automatic or revolver handgun and ammunition for the live fire exercises. This course includes classroom and range time learning to shoot revolvers and semi-automatic pistols. During the instructor-led-training portion of the course, the instructor(s) will validate your comprehension and application of gun safety rules; range protocol; proper handling; loading and unloading procedures; application of pistol shooting fundamentals; stable shooting positions. The insturctor(s) will also conduct a final live fire shooting qualification at a local range. Practical shooting exercises are then conducted at a local range. Warning: If you are pregnant or nursing, we require a written doctor's authorization allowing you to shoot and handle ammunition. Exposure to lead particulates in the indoor range as well as when handling ammunition may be detrimental to your child. Please consider that when making decisions regarding exposure to live-fire at the range. Consider the NRA Pistol Marksman Simulator Course as an alternative option.